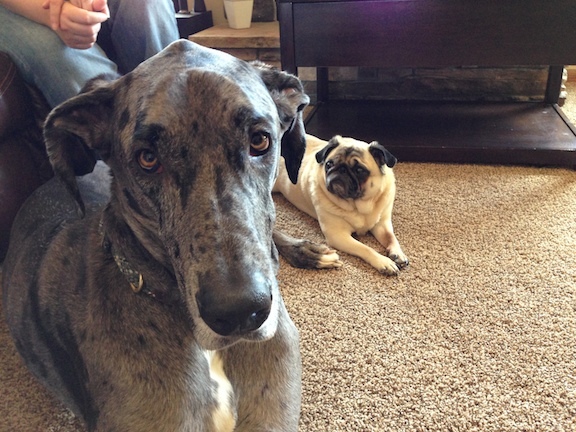 Allow me to introduce Tess, a three-year-old Great Dane and her room mate Harley, a seven-year-old pug. Their owner had contacted me to help with Harley who barked at the TV and other things. When I arrived for the session, both dogs met me excited but not overly so. I had to chuckle when we sat down as the dogs immediately jumped up onto the couch with their owners. While Harley didn’t take up much space, that wasn’t the case with Tess the Great Dane. After discussing the situation with their owners for a few minutes, I suggested their owners incorporate a few new rules to help the dogs see their humans in a more authoritative light. One of the rules that I suggested was to not allow the dogs on the furniture. At first both dogs obeyed when I showed their owners how to claim their couch. But soon after that Tess started to try to get back up on the couch. I showed hew owners how to communicate the couch was off limits, but Tess looked for ways around them for the better part of an hour. After it was clear that my normal way of disagreeing with the dogs went getting through to Tess, I came up with a few creative ways to dissuade her from the couch. It took another twenty minutes or so, but eventually Tess gave up and laid down across from us on the floor. Her persistence was impressive, but also means her owners will need to be ultra vigilant with the couch rule for the next few days in order for Tess to comply. Next I turned my attention to Harley and her barking issue. Most the time when I’m called in to help stop a dog’s barking it’s directed at people at the door. However in this case Harley’s stimulation came from the tv. Harley barked at several things; dogs, commercials, horses and even a basketball game. To see this in action, I had her owners turn on the TV and replay a few scenes with animals that was on their DVR. The first time Harley saw some horses, her energy level rose and she charged towards the TV barking. I made a sound to disagree with the behavior which stopped the barking as Harley walked away from the TV. I had her owner play the scene over and over while I taught them how to disagree with the barking. As we practiced, she reacted less and less each time. Not only did this stop her barking, it decreased her energy level as well. She was clearly less excited and able to move herself away from the television on her own despite seeing the same dogs and horses that she had barked at before. By consistently disagreeing with the unwanted behaviors and observing the new rules and boundaries, these dogs should fall into line within a few days. When that happens, not even an episode of the Dog Whisperer will get a bark out of Harley.